Saturday- We were up early and left at 8:55 to go to JoAnne’s in Glendale. I had signed up for a beginning quilting class at 9:30. There had been some construction on the road, so we needed to leave early. There were only two of us in the class and the other gal arrived at 9:50. The class was interesting, but it was two and a half hours. We ended up staying until 1:30. This is what I made. I have pinned it; the binding still needs to be hand sewn and ironed. Bob had dropped me off and picked me up, as I was taking my own sewing machine. Plus all the other items on the supply list. Linda’s step mother has move into an Assisted Living and she had been a quilter for years. So Linda had given me a her supplies, including some material. We left JoAnne’s, put the supplies in the car, and then walked over to the Subway in the strip mall. We both had 1/2 subs. Mine was not very good as I had a hot sub. They were out of chicken, so I had beef, and the bread was stale and over cooked. We will not go to that one again! We returned home, took a short nap, and settled in for the evening. There is a front that is coming through so the temp dropped to the 60;’ and the wind picked up. Sunday– We did our usual budgeting and bill paying this morning. Bob ran to Bash’s for the newspaper. We like the Arizona newspaper, but dislike the TV news personalities. They are really boring after the ones in Denver. The Denver newspaper is awful, so we gave up buying it. The one here in AZ is interesting and has enough coupons each week to pay for itself. Denver’s was boring and did not have hardly any coupons. We watched the Redskin game, ate lunch, then went to Walmart to do some grocery shopping. We returned and did some tasks around the MH, read the paper, ate dinner, watched TV and wen to bed. The weather had remained cold and windy. Monday– It was still cold, in the high 40’s when we woke up and the winds were to pick up, so I went out to ride my bike. I layered to keep warm and put on gloves. Just after I returned and got in the shower the winds picked up and were howling again. Bob went out and checked to make sure that we do not have any water in the portion of the slide under the MH which had water last week. We think that the water is getting in when we travel and not when we are sitting. The compartment is under the big slide. This is going to end up being something that PJ Miller is going to have to work on in the spring. I called Geek Squad, as we have a service plan with them, and they installed the Windows 10 on my computer. MaryAnne was supposed to go to the Botanical Gardens on a Paradise bus trip, but that was cancelled due to the cold, windy weather. So we went to lunch instead. We stopped at JoAnne’s as I had a 60% off coupon, which I used to purchase a mat for quilting. Normally $29.99, I bought for 12:99. The gal at check out asked if I had a coupon, as she said I really needed one for the mat. They all think the mat’s are overpriced. She proudly gave me the receipt pointing out how much I saved. I returned home and worked on privatizing the Windows 10. Bob left and went to the Dermatologist for his basil cell follow-up. He is to return next Monday for a larger excision of the area. We ate dinner, watched TV, read, played video games and went to bed. The weather continued to be horrible, with cold winds. The temp overnight is supposed to be in the 30’s to 40’s, cold for this time in AZ. At least the rain has moved out ! It is supposed to warm up later in the week, getting back to normal for a few days, in the 70’s. Tuesday- Bob took the dogs to the groomers for their 8 AM appointment. I cleaned the MH while he was gone. When he returned, I went to Mahjongg, although no one showed up today. since not everyone is here, we are short on Tuesdays and Trudi was sick. I went to the activity Center and signed up for the trip to the Dutton show. The Duttons are one of the groups in Branson and they are playing in Scotsdale, The trip is on December 19. I wandered over to the quitting room and talked to the ladies about joining the group. I returned and Bob was just getting ready to up date his computer to Windows 10. I took the car and went to the library to drop off books for donation and items that they are collecting to send to the troops for Christmas. I continued on to JoAnne’s as I still have 60 % off coupons. I have one more day to use them and they are able to be used as many times as you want. I returned, we ate lunch, and I went to Bunco. Bob was still updating his computer. I lost at Bunco, in fact I can’t even will as losing the most games! It was fun anyway. I returned and Bob and I made some changes to my computer that the Geek Squad guy had Bob do for his computer. We are now all set up with Windows 10. We went out to dinner with Linda, Mike, and MaryAnne. Ray prefers to play pool. He is very good and wins tournaments. MaryAnne had an excellent salad. The rest of us had the Campfire Feast. We brought home half for tomorrow! Wednesday- I had my manicure this morning, so I was off at 9 for that. I returned and we ate lunch. We played Mahjonng at 1. My lucky day, I won three games in a row! It was just MaryAnne, Grace and I at this point. Many of the folks are not here yet. The park gets very busy in January. Thursday- We went to the Sun City Farmers Market where we bought some tamales and spinach. We went to Zuppas for lunch so that Bob could try the place. We both had a nice lunch for less than $10, combined. We went to Costco for gas then did a little shopping there before going to Walmart to finish our shopping. We returned home and took a very short nap. I rode my bike as my new biking shorts had come in. The riding has been hard on the backside! We ate dinner at home, watched some TV, read, played video games. Friday- I went to the card group at the park. Bob worked around the MH. We ate lunch, then I went to the quilting room. 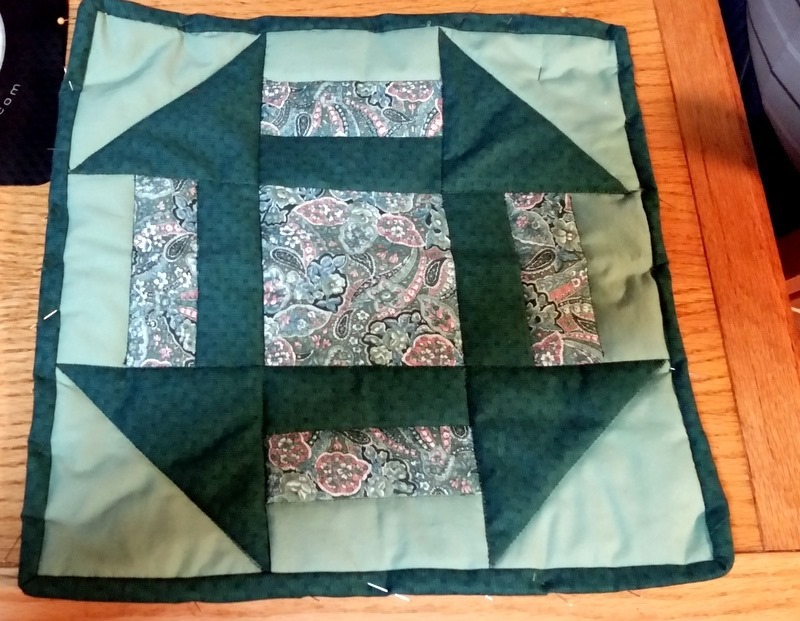 I returned quickly, as I had set up the piece for sewing, then came home and sewed it. For the quilters, I was stitching in the ditch. We went to happy hour at Mike and Linda’s. We had a great time, meeting some new Alfa owners, John and Wanda. We returned around 5:30, fed the dogs and got ready to go Square Dancing. This is the first time since I injured my ankle in 2012. We arrived, introduced ourselves to the Callers wife then the caller. We explained that we were there to “Angel” and to try to remember the patterns. We were both nervous about how we would do! This was a Beginner/Mainstream class. We did pretty well. The class was two hours. We were tired at the end, but decided we would sit and watch the Plus workshop that followed for one hour. The callers wife, Teresa came to us and asked us to dance as they were short people for a square. So we agreed, with misgivings. Surprisingly, it all came back quickly and we did really well! So we danced three hours! My ankle and knees held up very well. We were really happy and plan to get back into dancing as much as we can!